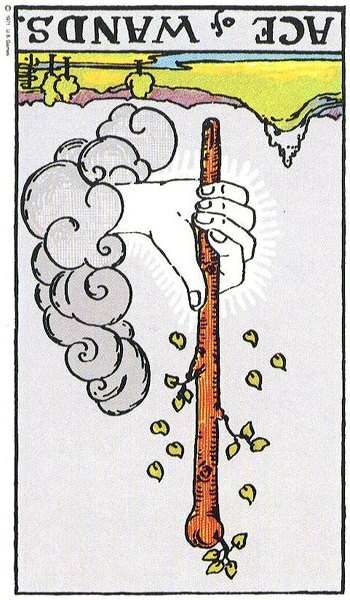 The Suit of Wands, also known as Rods, Staves, Batons or Clubs represents the Element of Fire. Fire relates to energy, enthusiasm, vitality, action, inspiration, creativity, career, a love of challenges and a definite need to travel. Wands people generally have a feisty and sometimes, fiery temperament. They thrive on challenge and conflict, and can deliberately seek it out if life becomes boring. Wands will certainly throw themselves into any project they pursue as long as it offers challenges that keep them on their toes. They have natural self-confidence and self-esteem. Fiercely competitive, the Wands enjoy sport and the more physical the sport the better. Their competitive and fearless nature will often see them excel in their chosen sport. Extreme sports will often be a favourite of such types. Fire likes to spread and grow, so Wand types love to travel and find it hard to stay in one place for long. This wanderlust spirit can sometimes be found in their inability to commit to a person, place or thing. They have a preference for hot climates when choosing a vacation destination They adore the sun although lounging by the beach or pool all day will not be their idea of fun or relaxation. They sometimes have a problem relaxing so will get great enjoyment out of activity vacations which might include water-skiing, paragliding, horse-riding, rallying, racing cars or rock climbing. In fact the more thrilling and dangerous the activity or risk the better. Wand types aren’t too enthusiastic about all that goes with being tied down in a relationship. They hate having to account for their comings and goings and being pinned to times, dates and places. So too do they resent their life being organised for them by a well-meaning partner. They prefer to fly by the seat of their pants and live life according to their own rules. They do not like to get overly-attached or under obligation to anyone or anything. They can fall out of love as rapidly as they fall into it. They are however exciting to have as partners, and if involved with a Wands type, life will be dynamic and certainly far from boring. Wands like their relationships to remain fresh and stimulating. They must be allowed a lot of personal freedom within their relationships and will be up and gone if the merest hint of nagging appears or if it all becomes too predictable and filled with habits and routines. The Wands type often need one of their own kind to successfully keep a relationship together as only one of their own kind will understand their need for freedom and excitement. Some of the other Suits wouldn’t have the stamina or nerves to keep up with them. They do tend to become more settled as they mature but will still need a partner who will match their energy and pace of life. On the work front as long as their interest is kept, their energy and enthusiasm will inspire all those around them, but once boredom sets in, it won’t be long before they pack their bags and move on to greener pastures. A nine to five job, sitting in the same office all week, surrounded by the same people and doing the same tasks day in and day out would be death to the Wands type. Outgoing and active, they love diversity, variety and physical movement. They need an outlet for all their energy. Wands love to be the leader of the pack and in charge. They prefer to boss than be bossed so will often be found as the employer rather than the employee. They can be fearless and brave in business and have no problem getting their hands dirty. They do have a tendency to take on too much though and have a problem delegating successfully. They can get excited about several different projects all at once which generally results in a dissipation of energy and resources. They can find it hard to remain focused and will generally need to have a couple of other Suits around such as Swords and Pentacles in order to plan working strategies and complete projects on time. In general, Wands have a wonderful love of life and a bright sunny disposition motivating all around them. They love to be centre stage and will be found as the life and soul of most parties. They love drama and have a tendency to develop huge egos. They often carry the belief that life revolves around them. As parents, they can be either wonderfully motivating and exciting or overbearing and domineering. If Fire burns low, depression, apathy, melancholy, stress and fatigue will be found. This is usually as a result of the Wand over-stretching him or herself by taking on too much and not resting. The typical Wands type will find it hard to retire or hand over the reins to someone else. They will often be found working until the day they die. Wands find it hard to understand and accept weakness, timidity or fear in others and certainly have no time for those who are sick. In general they never get ill having naturally strong and healthy constitutions. As a result, they cannot cope when they find it in themselves. Wands normally take their amazing self-confidence and self-esteem for granted, but when it falters or fails them they can become jealous and envious of others who appear more successful than they. They can become bitchy and malicious, arrogant and overbearing. Temper tantrums can be evident as they demand to get their own way or force it on others. In extreme, the negative Wands type can become the bully or tyrant. *When several Wand cards appear in a reading it generally indicates an intense period of energetic activity, movement or travel surrounding the issue. Things are happening. Life is certainly keeping you on your toes.